ll her life Lucinda Price has seen the shadows, dark shapes that boil up out of nowhere and fill her with fear. Yet as frightening as these shadows are, it isn't until the summer before her seventeenth birthday that things take a sinister turn. As a result she is sent to the Sword and Cross reform school. Yet before her first day is through she's made two possible friends - Arriane and Penn - spotted two hot guys - Cam and Daniel - got in her first fight, earned her first detention and been given a new nickame: Meat Loaf. Can anyone blame a girl for wanting to go home? But the longer she stays, the more intriguing things get. There are mysteries at Sword and Cross, and not all of them lie beneath the surface. 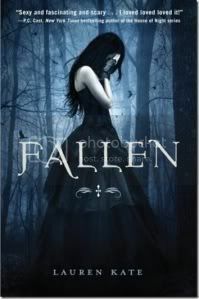 The first of the Fallen series has a very slow build-up, mostly because the big mystery Luce is working towards is made obvious by the title, the back cover blurb and the prologue. Not that Luce could be blamed for not figuring it out sooner. Prepare for a lot of weird decisions and angsting along the way, before she finds the truth. However, the set-up of Sword and Cross is convincingly depressing, while Luce's fellow students are by turns crazy, intimidating and intriguing. It would just be nice if things happened a little quicker. As a main character Luce is mostly bewildered, and at times annoyingly feeble (her interactions with Cam in particular). Luckily Penn is far more proactive, jabbing her into interesting situations, while Arriane's appearances are always curious. Daniel's hot and cold behaviour does drag a bit, but it's understandable as things progress. And they do, finally, though Luce's POV does limit both the understanding and the action. For me she was too weak to tell the whole story, so a break in POV (to almost anyone else) would have made things go much quicker, and more smoothly. Despite the slow pace, and occasional dimness of Luce, this is still a pleasantly readable tale, laying the foundations for what could be a really good series. (I amused myself in the slow parts by trying to identify who might turn out to be what). And angels make a nice change from vampires. It'll be interesting to see what happens in the next, but for now too much build up, not enough action.